In the small river town of La Luna, Louisiana, Calla Lily Ponder bursts into being, a force of nature as luminous as the flower she is named for. Under the loving light of the Moon Lady, the feminine force that will guide and protect her throughout her life, Calla enjoys a blissful childhood—until it is tragically cut short. From her mother, Calla learns compassion and healing through the humble womanly art of "fixing hair." On the banks of the La Luna River, she discovers a sweet, succulent first love that is as enticing as the music, food, and dancing of her Louisiana home. When heartbreak hits, Calla leaves the familiarity of her hometown and heads downriver to the untamed city of New Orleans, where her destiny further unfolds. The Crowning Glory of Calla Lily Ponder is the story of a pink-collar heroine whose willingness to remain vulnerable in the face of adversity opens our own hearts to the possibility of love growing from sorrow. Wells lives in Seattle now, but Louisiana is clearly still vivid in her life and work. Talk about Wells' fictional Louisiana, and how the setting of La Luna expands that growing landscape. The natural world plays a major role in this story: the La Luna River and the Moon Lady are as fully realized and important as any of the human characters. Talk about how Wells is able to weave together the mystical and the ordinary. Why do you think this works? The Crowning Glory of Calla Lily Ponder is a standalone novel, in which Rebecca Wells introduces a brand new character, Calla Lily Ponder. 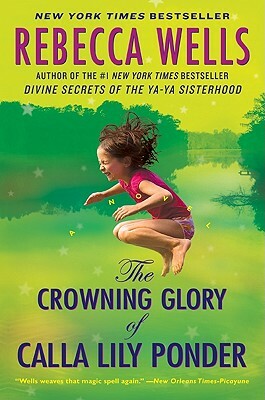 Wells has referred to this new book as a "spiritual cousin" to her Ya-Ya books. How do you think it relates to Wells' previous works? Wells has long been praised for her ability to write honestly and movingly about family, friendship, and love--all important themes in this new book. How did she approach them differently (or similarly) to tell Calla's story—starting with the fact that there is one very central character here? Wells' previous books have dealt extensively with the idea of sisterhood. This new novel depicts female friendships across racial, generational, and socio-economic lines. Talk about Calla's "sisters," and how each one provides different kinds of support for her emotional journey. Wells has observed that in mythology, legend, and even in present time, hair symbolizes the soul. Hair plays a large role in Calla's life. What does "crowning glory" mean in this story? Why is it such a touchstone for Calla throughout her life, especially when paired with her memories of her childhood? What does the book's title signify to you? From her mother, Calla inherits "healing hands," the power to not only beautify a woman's exterior but also to connect with and mend the emotional turmoil underneath. Why isn't it until her adult life in New Orleans that Calla is fully able to appreciate her gift? Think about some of the unbreakable bonds Calla has in her life: with M'Dear, with Sukie. Talk about the Moon Lady's influence as a guiding force throughout Calla's life. Is it just as strong or even stronger than Calla's human relationships? Over the course of the book, Calla experiences first love and then, later, a more mature love. How do the men in her life reflect both her essential nature and her growth? Talk about Wells' ability to depict male characters in this story. Calla goes through heartbreak and loss throughout this story, but she manages to find inspiration through tragedy. How is she able to do this? Is this a strength she was born with? What do you imagine might happen between Calla Lily and Tuck the day/week/month after they drink that cup of coffee together?